Eating, eating and more eating is one of the many side effects of prednisone. Your cat probably hates taking prednisone more than you hate giving it, but stopping the medication suddenly can make for a very sick kitty. Think of it as going down a flight of stairs: leaping from the top step isn't a great idea. It's better to ease your way down. Your cat might be on prednisone but is probably on prednisolone, as prednisolone is thought to be safer for felines. The two work in the same manner. So as long as you're not a veterinarian writing out the prescription or telling your vet what medicine your kitty is on, you can just think of it as prednisone if you'd like. Prednisone suppresses your kitty's immune system, which is important for immune disorders like lupus. It's also used for other health problems, including cancer. Prednisone is a corticosteroid, which is something your cat's adrenal glands naturally produces in the form of cortisol. When you start giving prednisone to your likely unwilling feline, her adrenal glands will slow down the production of cortisol dramatically. If you stop giving her prednisone suddenly, her adrenal glands won't be able to adjust quick enough and they won't produce enough cortisol. That can result in scary effects that range from fatigue and trembling to the development of Addison's disease or even death. Once your cat's adrenal glands realize that the prednisone is leaving her system, it's like an alarm goes off. The glands will slowly start producing cortisol again, but it takes a little while for the levels to go back to normal, so a bit of prednisone still needs to be coming into her system, but less and less of it as time goes on. That exact amount and the weaning schedule must be completely determined by your vet. Prednisone has way more of an effect on your cat's adrenal glands if the dosage is higher and if she's on the medication long term. Still, even something like a two-week treatment calls for a tapering off of the steroid. A year-long treatment sometimes requires a longer weaning period. In many cases where long-term treatment is needed, your vet might put your kitty on prednisone every day initially, but eventually change it to every other day or so. That way, the adrenal glands keep pumping out cortisol and don't stop production completely, so you'll have an easier time of weaning her off the medication, but that's at your vet's discretion. 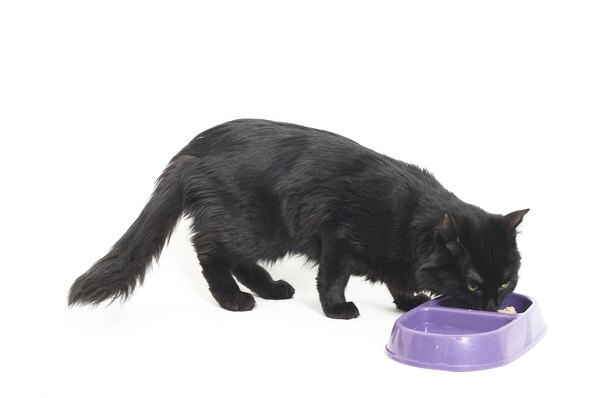 While prednisone usually causes less severe side effects in cats than in dogs, your little feline can still develop some nasty symptoms, like having to urinate every hour and drinking enough water to keep you plenty busy refilling her bowl. Behavioral changes can also occur, but all those side effects disappear when prednisone is out on the curb instead of in her system. So it's completely understandable if you want to stop giving her the medication, even though it's helping keep her as healthy as possible. Have a chat with your vet about possible alternatives to prednisone, which can include a hypoallergenic diet, giving her antihistamines or adding supplements to her diet. But your vet knows best, so always consult with him. Can Corticosteroids Cause Behavioral Changes in Cats? Can Prednisolone Affect a Cat's Breathing?